Slip-and-fall accidents are a serious matter. Carlisle has a new product that can make your kitchen safer. 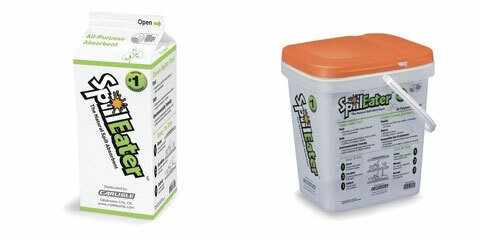 SpillEater is an all-natural spill absorbent that is up to 58% faster than all other absorbents. Use SpillEater on any kind of spill, including food spills, chemical spills, fuel spills, or even bodily fluid spills. SpillEater naturally biodegrades petroleum oils, suppresses odors, and leaves no slippery residue. Made of plant fiber, it is an environmentally friendly, EPA compliant, and USDA certified, bio-based product that can be discarded in normal trash receptacles once used. Carlisle’s SpillEater is perfect for foodservice establishments, and can be easily added to any kitchen. SpillEater is available in 2 lb. cartons or 20 lbs. pails. 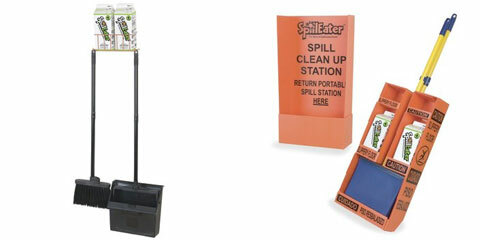 Carlisle offers a wall mounted Spill Station Kit that includes two cartons of SpillEater, a dustpan, and a broom. They also offer a Portable Kit that comes with a rolling spill station, dustpan, and squeegee-broom. A 4-foot SpillEater sock contains and absorbs spills by encircling them. All of these provide a ready access solution when spills occur. The Center for Disease Control & Prevention and the Bureau of Labor Statistics, slip-and-fall injuries cost employers approximately $40,000 per incident on average. While not all slip-and-fall injuries are directly related to spills, commercial kitchens are, by their nature, predisposed to such accidents. Make your kitchen safer with SpillEater.